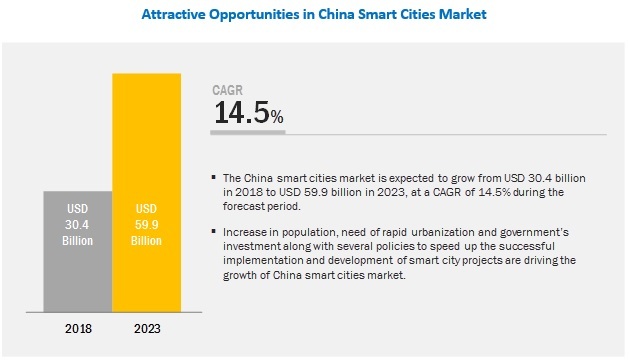 [163 Pages Report] The China smart cities market is projected to reach USD 59.9 billion by 2023 from USD 30.4 billion in 2018, at a Compound Annual Growth Rate (CAGR) of 14.5%. The growth in this market is driven by the increase in population, the need for rapid urbanization, and governments investments and policies to speed up the successful implementation and development of smart cities projects. China is taking efforts to improve the surveillance of its people by bringing in capabilities, such as Artificial Intelligence (AI), and facial and gait recognition. The video camera segment in China is annually growing with a rate of 18.1%. China is more focused on surveillance systems that connect security cameras nationwide via the cloud to a database of every person’s facial ID profile and a file of their personal details. Hangzhou-based Hikvision, a video surveillance company, possess 21.4% of world’s market share of CCTV cameras and video surveillance equipment. The Chinese government owns a 42% stake of Hikvision. In 2015, the Ministry of Public Security launched a project, aiming to establish a giant facial recognition database to identify any citizen within seconds; the project is still under the development phase. It targets to achieve an accuracy rate of 90% but faces formidable technological hurdles. The project aims to identify any one of its 1.3 billion citizens within 3 seconds. The country is more focused on real-time analysis of surveillance data using sensor systems to improve the public system and the security. Panoramic-View Body Cameras with Inbuilt Facial Recognition: China is taking efforts to identify wanted suspects in real-time. For that, police officers across China will be equipped with panoramic-view body cameras that come loaded with facial and gesture recognition technology. Beijing-based Nebula Science and Technology have developed the surround-body camera with inbuilt facial recognition technology that enables cops to identify suspects and ensure complete video evidence of incidence. The camera can capture 720-degree (fish-eye-like panoramic views), high-definition footage and has gesture recognition capability. It is estimated that 3,000 and 4,000 police officers in China are currently equipped with its body cameras. The device is equipped with 4G and Wi-Fi connectivity, connected to a central database containing identification photos of Chinese citizens. Facial Recognition Cameras: A school in eastern China installed cameras to monitor students’ facial expressions and attentiveness in class. The cameras will act as a part of school’s “Smart Classroom Behaviour Management System”, providing real-time information of the students to their teachers. Shenzhen has expanded its traffic surveillance programme by installing facial recognition cameras to identify drivers violating the traffic rules such as driving without valid license. The cameras are able to provide an image of not only number plate but also the driver’s face. China is building the giant facial recognition database with the power of identifying any one of its 1.3 billion citizens within 3 seconds. Facial Recognition System: The system has been installed at Hong Kong-Shenzhen border to accelerate custom checks on the border that consists 6,40,000 crossings every day. It checks visitors’ appearances against a database of faces and travel information and alerts customs officials if found suspicious. Fingerprint matching, facial recognition, and thermal-scanning technology: The technology is being tested at the border crossing of Hong Kong-Zhuhai-Macau Bridge. The system is based on AI technology and is able to complete immigration clearance in under a second with up to 99.5% accuracy. The high-resolution cameras, fingerprint matching, and thermal-scanning technology have been deployed for one immigration lane at border control. The major vendors in the China Smart Cities Market are Advantech (China), Kontron (Germany), CRRC (China), Hollysys (China), Nari Technology (China), China Railway Electrification Engineering Group (China), Hikvision (China), Dahua Technology (China), and Seavo Technology (China). In October 2018, Dahua launched the "Heart of City" strategy in China, a new smart city framework, which would be applicable at industrial and commercial levels. This framework is based on technologies, such as the Internet of Things (IoT), deep learning, and AI. In August 2018, Kontron acquired Inocybe Technologies to boost its Network Functions Virtualization (NFV) and Software-Defined Networking (SDN) offerings for the telecommunication sector, Cloud Service Providers (CSPs) to expand its IT network operator customer base and to help enterprises and smart cities deploy hybrid cloud infrastructures. In October 2017, CRRC developed a smart rail system called Autonomous Rail Rapid Transit (ART) to boost the transportation system of Zhuzhou city. In April 2017, Hikvision won the bid for a Public-Private Partnership (PPP) project, the Urumqi Hi-Tech Zone Safe City Project, with USD 75 million. Under this partnership, Hikvision will install and maintain 30,000 video surveillance cameras in the Urumqi Hi-Tech Zone Safe City. Who are the major players in the China smart cities market? What are different growth trends in the market? What are the drivers and restraints for the market? What are the major verticals types in the market? Which verticals in China are the major adaptors of smart cities solutions? The study involved 4 major activities in estimating the current size of the China smart cities market. Exhaustive secondary research was done to collect information on the market as well as its peer and parent markets. The next step was to validate these findings, assumptions, and sizing with industry experts across the value chain using primary research. Both top-down and bottom-up approaches were employed to estimate the complete market size. Thereafter, the market breakdown and data triangulation procedures were used to estimate the market size of the associated segments and subsegments of the market. In the secondary research process, various secondary sources such as Hoovers, Bloomberg BusinessWeek, Forbes, and Dun & Bradstreet were referred to, to identify and collect useful information for a technical, market-oriented, and commercial study of the smart cities market in China. These secondary sources included annual reports, press releases and investor presentations of companies, whitepapers, World Bank reports, and reports from the Organization for Economic Co-operation and Development (OECD). Secondary data was collected and analyzed to arrive at the overall market splits, which was further validated using primary research. Secondary research was mainly used to obtain key information around the industry’s supply chain, the total pool of key players, market classification, and segmentation. It was also used to obtain information about the key developments from a market-oriented perspective. This research report categorizes the smart cities market in China based on the smart transportation, smart infrastructure, and video. With the given market data, MarketsandMarkets offers customizations according to company-specific needs.